Some pieces may need a little persuasion! Storing cutlery neatly can be difficult, particularly if you have a large family, or have just amassed a larger than average collection over time. 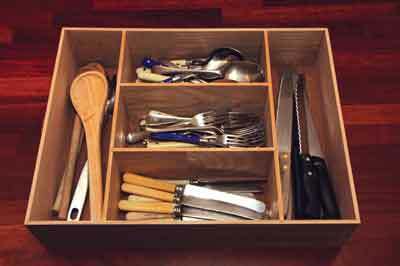 Plastic cutlery trays are often supplied with kitchen drawers but they tend to be shallow and have a limited capacity. 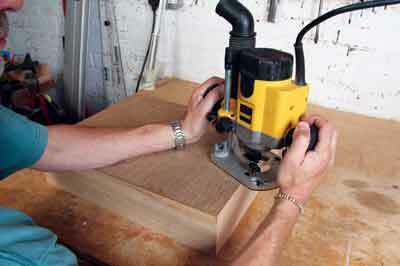 It is not difficult to make your own tray to suit your exact requirements. 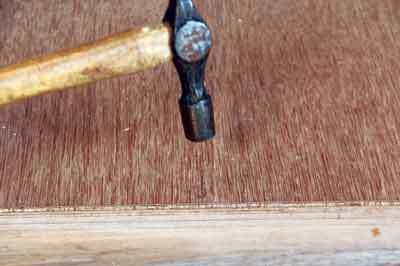 You don't need much timber and only a few tools. 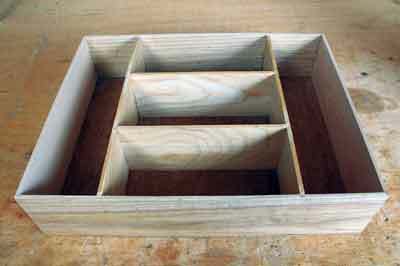 In this design the divisions are set in housing joints, and the best way to cut these is with a router. 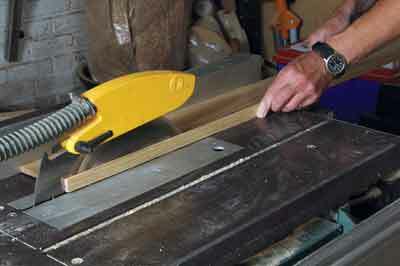 The secret of good housings is to thickness your timber accordingly to suit the cutter width. 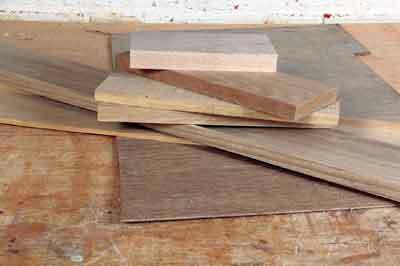 A rather mixed selection of offcuts of beech (Fagus sylvatica), ash (Fraxinus excelsior) and a bit of ply that should be enough for this project. 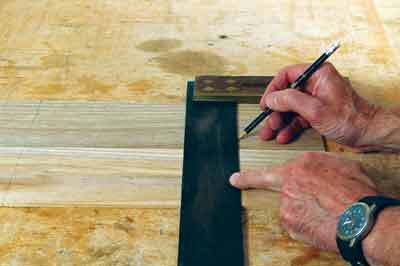 Rip your timber to the correct width. 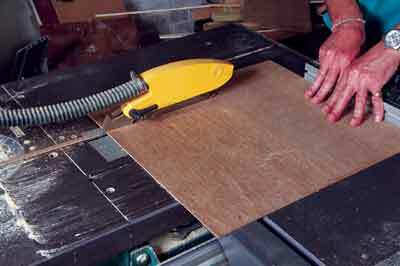 If your offcuts are thick, resaw to size rather than planing, then clean up with a plane or sander. Make the four sides of the frame first. 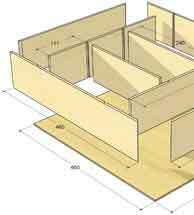 They are jointed with simple mitre joints. 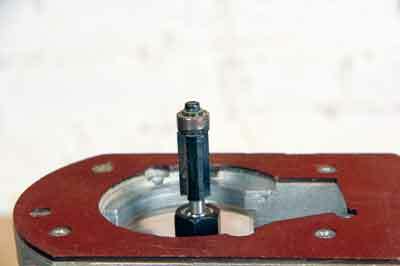 Once you have made the frame components, assemble them and hold them in place with a frame clamp. Now you can decide the position of the dividers. Mark the edges of the boards. 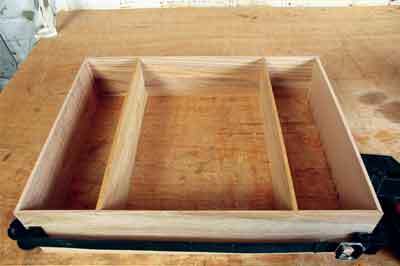 The next step is to dismantle the frame and mark the divider positions across both boards using a try square. Cut the housings on both boards at the same time. 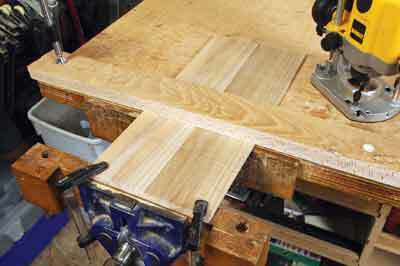 Line up the boards and clamp a batten across them to guide the router. 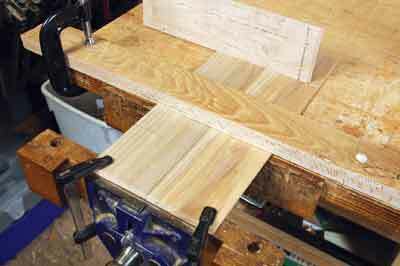 I have used the bench vice here to provide additional support for the ends of the boards. 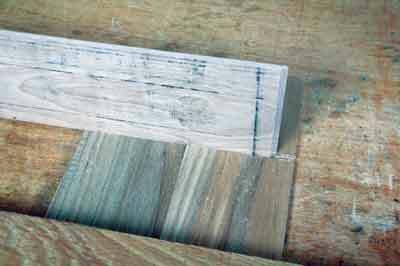 You now need to set the cutter depth to one-third of the thickness of the board, in this case 2mm. 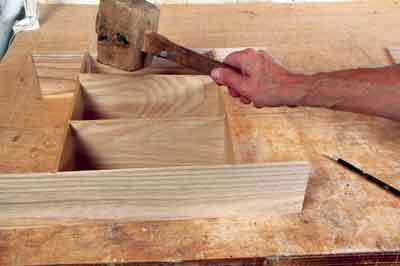 Hold the router tightly against the batten and rout the housing, moving from left to right. ... slot into the housing to hold the boards in perfect alignment. The boards set up ready for routing. 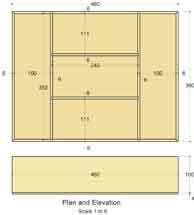 Assemble the box again and measure the length of the divisions. Now you can rout to length and slide into position. 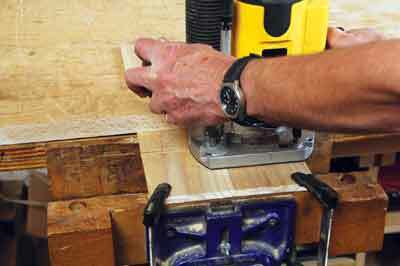 You now need to decide on the position of any further dividers, mark and repeat the routing process until all your joints are cut. 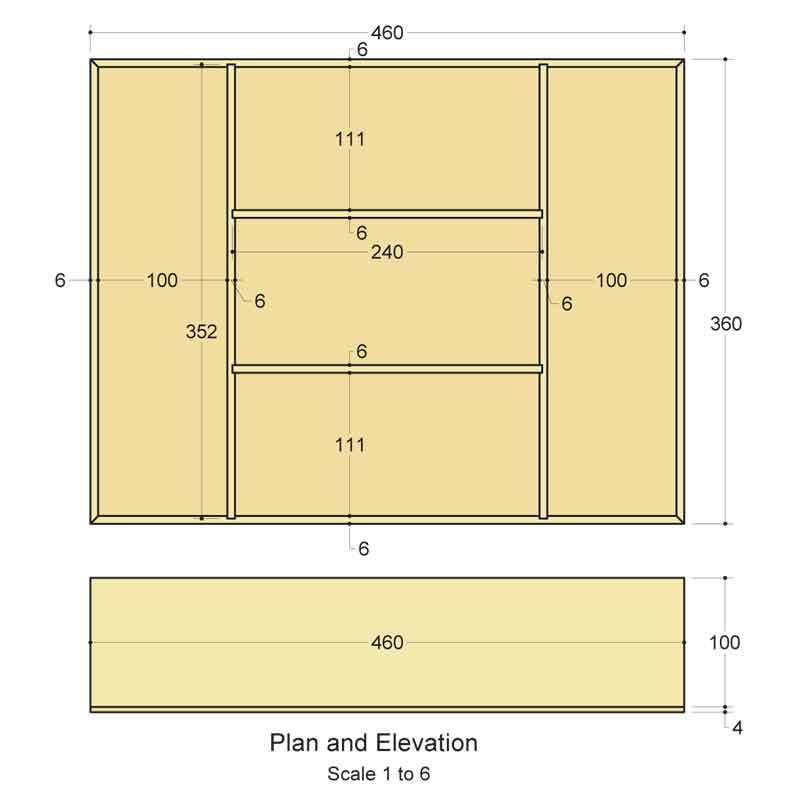 You need to assemble the box in stages. 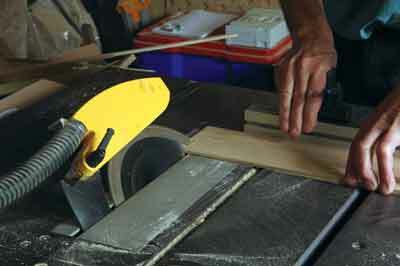 Apply a small amount of glue to the housings and slide the boards into position. You may find that some will need a little additional persuasion. Finally assemble the ends and use a frame clamp to hold the piece together. 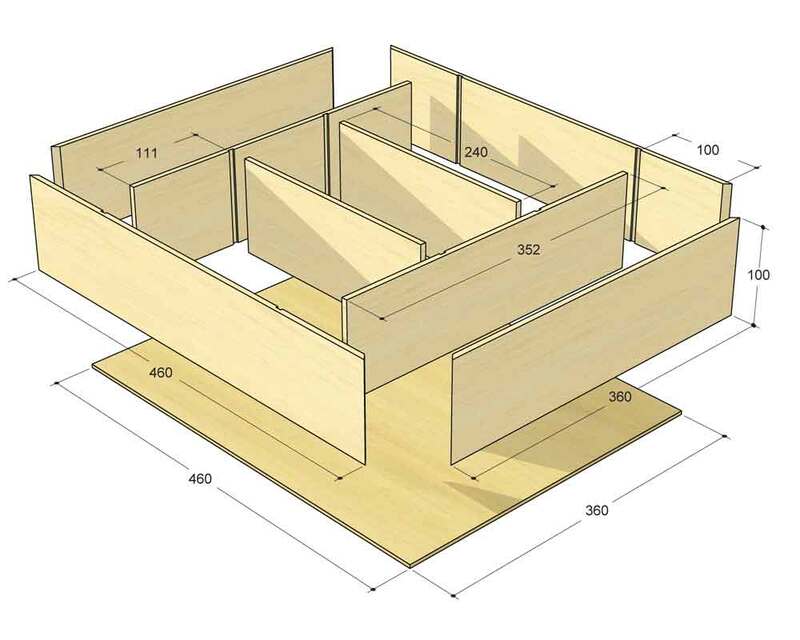 The baseboard for the cutlery tray is a piece of 4mm ply which is simply pinned on to the underside of the project. 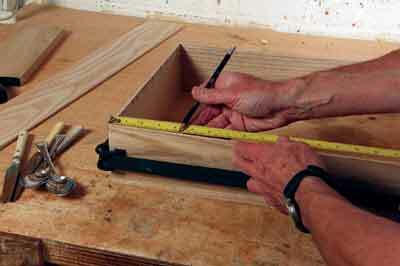 You need to measure the box and cut the ply slightly oversize by a couple of millimetres each way. 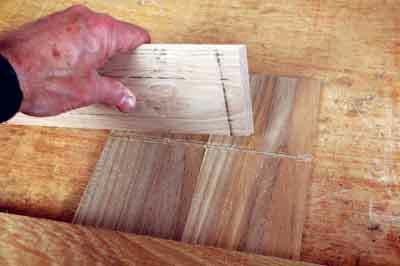 Next, once the glue has sufficiently cured, you can pin the baseboard in position. 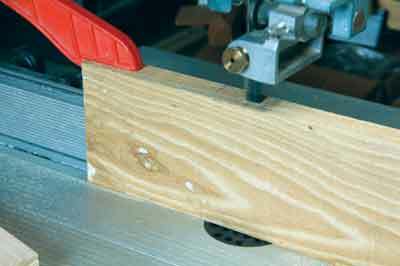 You can then fit your router with a bearing guided trimming cutter. 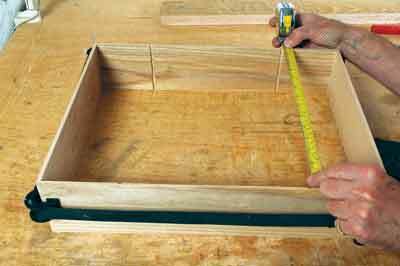 Now run it round the edge of the box so that it trims the baseboard flush with the edge of the box leaving a nice neat finish. 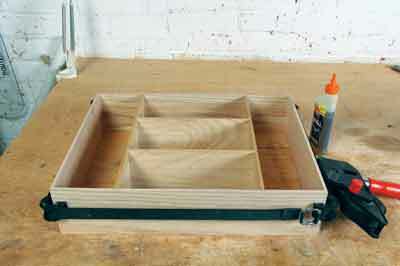 The completed cutlery tray should look something like this one.